The projectile that was launched into the Golan Heights on 20 January was a "medium-range surface-to-surface missile" that was transferred from Iran to Syria after January 2016, meaning it was a clear violation of Annex B of UN Security Council Resolution 2231, Israel's ambassador to the UN stated in a 4 April letter to the Security Council, Jane's Defense Journal reports. Ambassador Danny Danon did not identify the missile but said it "flew no less than 60 km" and was equipped with a "precise warhead". 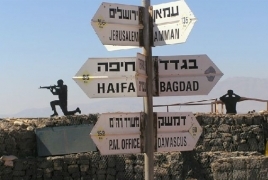 "The [Security] Council must take responsibility for stopping these activities that continue to jeopardise the safety and security of our region," Danon said in the letter.